While not in the “formal program” of the World Economic Forum in DAVOS itself, in the midst of the poisonous campaign against LGBT citizens in Russia and in Nigeria, where homosexuality is illegal, life threateningly dangerous and where even supporting gay rights punishable by ten years in prison, this morning there was a classic WAF power breakfast in DAVOS titled “The Global Fight for LGBT Equality” which drew some very boldface names, including two US senators (Patrick Leahy and Claire McCaskill) as well as Navi Pillay, the UN high commissioner for human rights. The breakfast was sponsored by a broad cross-section of WEF partners: corporate support came from Credit Suisse, the Huffington Post, Microsoft, and Time Warner, while the main people making the breakfast happen were two big-name hedge-fund managers, Paul Singer and Dan Loeb. The breakfast took place across the street from the concrete walls of the WEF conference center, and one of the big questions was whether the clear sense of urgency and importance of LGBT rights worldwide would help the cause receive more official WEF recognition next year. 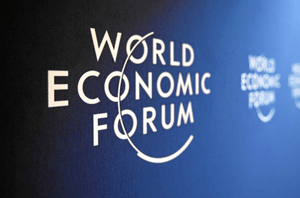 “Event organizers said the World Economic Forum (WEF) in Davos had declined to host the LGBT event; the main gathering in Davos this year features guests like Nigerian President Goodluck Jonathan, who recently blessed the world’s most repressive law restricting LGBT rights. The reason for not LGBT panels is easy to guess. Heads of state are at the top of the pecking order in Davos, and any LGBT panel would undoubtedly be against individuals like Goodluck Jonathan and Vladimir Putin. The way the WEF works, if someone like Putin makes it clear that he doesn’t want any such panel to take place, then the panel won’t take place. But even without an “official” LGBT panel, the issue involving LGBT rights and the lack therefore of is causing serious problems for Davos regulars like Nigerian finance minister Ngozi Okonjo-Iweala. Every time that she’s asked about LGBT rights in Nigeria, she gives a what-can-we-do answer about how the law is very popular among Nigerians and how therefore the president had no choice but to sign it. As Fareed Zakaria noted in today’s event, that answer misses the difference between a tyranny-of-the-majority democracy, on the one hand, and a grown-up liberal democracy, on the other. Humans don’t lose their rights just because they’re in the minority, and it’s the job of any democratic leader to refuse to support the forces of intolerance and hate within his country. Besides, as Richard Branson said at the breakfast, you can get pretty much any result you like, in an opinion poll, depending on how you ask the question. Other attendees at this mornings breakfast panel featured LGBT activists from around the world including: Alice Nkom from Cameroon, Masha Gessen from Russia, and Dane Lewis from Jamaica. There have been no reports if Chad Griffin from the HRC was able to pull himself away from Goldie Hawns side and attend the breakfast after comforting her for gushing over meeting Nigerian President Jonathan Goodluck before knowing his hateful anti-gay beliefs. Donald Trump Fires Back at “Dump Trump” Petition, CHER Fires Back at Trump and Macy’s! Force the western economies to take into account the powers that gay people have, economically! To boycott the countries that ignore equal rights, to ban countries and individuals that fight equality from international fora, from cultural, social en economical events! We’re everywhere, and we’re all around! And we want and demand equality!